(Sept.14, 2018) -- The community is invited to take part in several events that celebrate the culture, contributions and heritage of Hispanic Americans during Hispanic Heritage Month, Sept. 15 to Oct. 15. UTSA is traditionally recognized nationally as a top choice for Hispanic students seeking a college degree by such respected publications as Diverse Issues in Higher Education and Hispanic Outlook on Education. 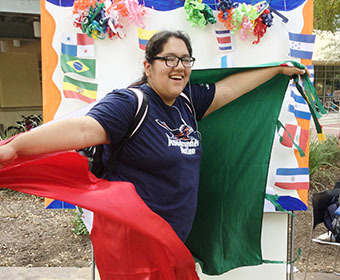 More than 17,000 Roadrunners classify themselves as Hispanic, comprising 55 percent of UTSA’s student population. Saturday, Sept. 15, 7 p.m. to 8:30 p.m. The UTSA community is invited to join in the parade that preserves and memorializes occurrences in local Mexican-American history, particularly recognizing San Antonio de Bexar’s important role in “El Grito de Dorores” (the Cry of Dolores) and the Mexican War of Independence. This street fair organized by the Student Center for Community Engagement and Inclusion recognizes the contributions of Hispanic and Latinx Americans with a variety of fun activities including games, food and music. Pick up a group exercise Loteria card from the Rec Wellness Center membership desk and win prizes while trying out a variety of group exercise classes. Attend a class listed on the card, get it stamped, make a pattern and win some swag. Additionally, UTSA Athletics is celebrating Hispanic Heritage Month with limited edition caps available at Rowdy Campus Store and Lids. The caps will also be available before the UTSA football games against Texas State, UTEP and Louisiana Tech at the Rowdy Campus Store tent at Rowdy Town on the H-E-B Plaza located on the north side of the Alamodome.